It’s been about a year since my rare USA spec 1990 Rover Sterling 827 Fastback returned to active duty. It has been a year of driving that reminded me that, if some BL/Rover products require a little more care than other brands of vehicles, at least you get paid back by driving a stylish car that draws compliments from people who value and appreciate fine design. You may recall, that I “accidentally” bought the car late in December 2007 by making a ridiculously low offer after it failed to sell on eBay. My offer wasn’t low enough, though, and before I knew what happened, $2,000 left my bank account and the Rover was on its way to cold, gnarly, Detroit from its home in sunny California. It took about three months and around $4000 to get 95 percent of the car’s myriad problems sorted…inoperative speedometer, broken windshield, headlights that only worked on main beams, an oil leak and more. But, since the initial repairs were completed, it’s been smooth sailing for this particular Rover. In 2008, I piled roughly 8000 miles on the car – the majority in what would have be considered tough conditions. I bought the Rover to use as my winter car because the front-wheel drive is safer and more reliable than my rear-wheel drive Ford Mustang. Many fall and winter mornings I have left my house and found the Rover encased in a thick blanket of snow. After these all night deep freeze immersions, she has never failed to start. Once started, she has never failed to convey me to my destination safely and without incident. 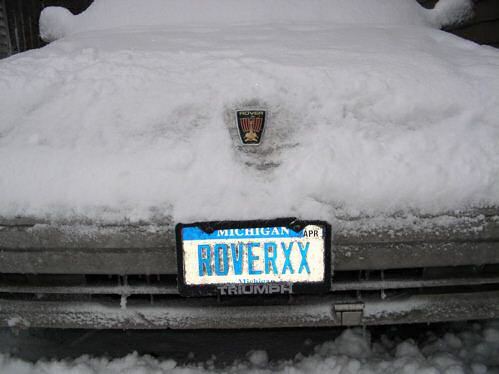 Simply put, the Rover excels in winter driving over the snowy, potholed, streets of Detroit. Cars are not like bottles of wine that get better with age. You buy them, wear them out and ship them off to the breakers. But not this particular Rover 827. There are now 110,500 miles showing on the clock but I know she has gone much further because the speedometer didn’t work for several years. And yet the car is in better health today than it has been in a very long time – almost everything works now. I can think of only three minor features not working: the seat heater, the air conditioner and the remote door locking system. That’s not bad for a 19 year old car with a less than sterling reputation in the USA. When I look back at the receipts for the repairs I made in 2008 after I recommissioned the car, I see they are few. I changed the oil and filter once using the most expensive synthetic oil I could find. That was $50. I bought on eBay a new old stock driver’s window switchpack for $25 – that finally cured the inoperative mirror controls. I bought a good used power resistor or some such that goes under the dash and enables the fan motor to work on all three speeds. And that’s it. I bought a new air conditioning compressor and evaporator on eBay for cheap right after I bought the car but I never had them installed. Driving with the windows down and roof open keeps the car cool enough. One particular repair didn’t cost me anything but I think is a good illustration of Rover’s bad luck in the USA. I could never get the rear window defroster to work. Pressing the button caused the fuse to blow. Finally, last fall, I traced the problem back to the tailgate and the radio antenna/amplifier unit. I removed this part out and took off the cover. Inside, I found a huge dead spider or some other California bug from the paleolithic era that had woven some kind of web between a diode or other electrical part and the case. That was grounding out the system – only in a Rover could this happen. Once cleared and reassembled, the defroster hasn’t given a bit of trouble. I never intended to put so many miles on the Rover in 2008 but the fact is it’s a comfortable, well-made, car that looks sharp, delivers velvety smooth acceleration, about 26 miles per US gallon and, with its large rear cargo area, has proved to be extremely capable. Many warm sunny days, the Mustang would stay in the driveway while the Rover got the call. I didn’t really intend to buy the car. I didn’t really want to spend so much to make it roadworthy but I am very glad I did. And I regret nothing. 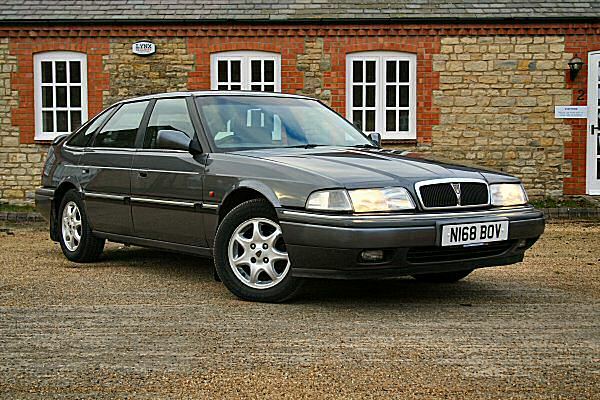 In the simplest possible terms: my Rover 827 Fastback has been a joy to own and drive. Richard, I do enjoy your articles but can I just say I think the 800 was built at Cowley rather than Longbridge. Glad that someone appreciates all the hard work & shoestring engineering that we did at Cowley despite BAE cost cutting & not allowing the inprovements in quality & reliability that we wanted. I bought a 825SL in 1987 and had in the garage for the entire time. There is just over 50K on the clock and I would say in very good condition.Do you know anyone interested.I live in CA.